"Hi! We are Kristina and Jennifer from Modern Frills. We are stay at home moms with 5 energetic kids between the two of us. We are also sisters. We love to do things together. For the past several years, we have talked about doing "something" together...we just didn't know what that "something" was going to be:) All the while, making clothes for our kids and not even realizing that our "something" was right in front of us! 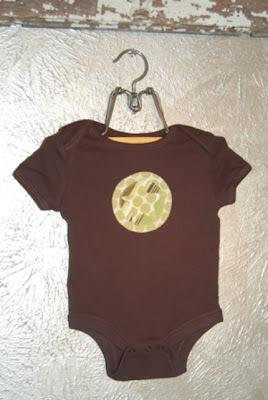 Our friends started asking us to make clothes for their kids thus Modern Frills was born. Our designs are simple and sweet. We love fabric, especially all of the fabulous independent designers! We hope you enjoy our shop and all of our modern frills." Are you dreaming of a pink Christmas? Don't leave the boys out! would be on the top of my list for a little guy. I am so in love with their fabric choices. They make me look at my fabric stash in a whole new way. or a classically unique t-shirt. Can you live another minute without such fabric goodness? Come back here and tell me you favorite item. 2. Make a purchase from their shop. 3. Follow Modern Frills on Twitter. Well I just love the pumkin applique t shirt, it would look sweet on my daughter and I love Halloween. I'd love a tote though! I love the peace sign tote and the love tote and the peace and flower tank... Its hard to decide. I am lovin on the Personalized Baroque Frame Shirt with Initial Monogram, tee, tank top - Rose Damask in Orange by Joel Dewberry Halloween, super sweet! officially obsessed with fall, I LOVE the Whimsy Pumpkin Applique Shirt!! A must have. I can't decide between the peace and flowers shirt, any of the Halloween stuff, or the Pumpkin shirt. It's all so cute! So cute!!! Since I am totally in love with the cute owls right now - I have to go with the Modern Patchwork Owl! Adorable!!!! I like the BOO applique tote bag! How cute! love the love tote! all of the fabrics they use on their products are amazing! My favorite is the tote with the little bird/quail! Soooo cute!!! My favorite items are the initial anything! the shirts and the bags are adorable!! As much as I love the bird silhouette tote, my daughter(2 years old) flipped when she saw the monogrammed girl silhouette tote. I think I'd have to concede to her on that one and get her a bag if I won. I love the orange polka dot damask halloween boo shirt! Too cute!!! I love the pumpkin shirt and the butterfly tote! There are so many cute things. My favorite is the pumpkin applique t-shirt! Everything is wonderful! I LOVE the tote bags (especially the bird one!). I want one!...please. I love the monogrammed tote bag...oh, and butterfly silhouette tote bag too...and the cross applique shirts...good thing I don't just have to pick one thing! Love the Boo HALLOWEEN Trick or Treat Bag! It's Too Cute! I LOVE LOVE LOVE the Butterfly Silhouette Tote Bag! So cute! I like the Double Baroque Frame Fabric Initial Tee. Cute stuff! I love the "boo" trick-or-treat bag. Too cute! I love the "love" tote bag ... I wish I had a little girl to put in those cute t-shirts! Oh my gosh...Seriously..what's not to love?! I love the birthday shirts, peace & flowers, skull & crossbones, the initial shirts, the bags. Seriously...love it all! I love the cameo shirts. So Cute! Thanks for showing us a great new Etsy shop! I love her stuff!! The little girl shirts that say "boo" on them are awesome. But I also love the little girl guitar shirt. Since my husband is a country musician that would be perfect!! I love the monogram tote! I am always looking for a great tote to lug my papers around to and from work. I would actually want the Baby's First Tattoo Dragon Tee! I think it's super cute! I really like the Peace and Flowers Applique Tee. It is so adorable! I also love the Black Boo Shirt. I am lovin the Peace and Flowers Applique Short Sleeve Shirt. I really like the boy's rocket tee. Such a cute shop!!! 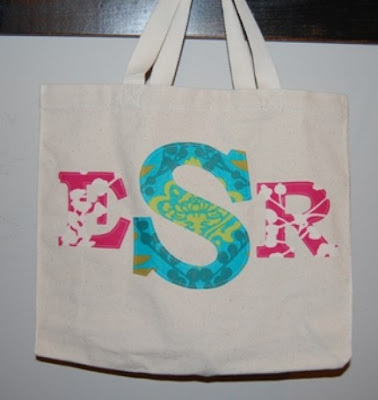 My fav is the Classic Personalized Fabric Monogrammed Initials Tote Bag....sooo cute! I love the orange polka dot Boo shirt! Thanks for a chance to win! Oh my gosh, if I had the $ right now I would buy that skull and cross bones tank. That is to die for!! I like it all. All of her items are so fun and cute. I really like the Halloween bags. 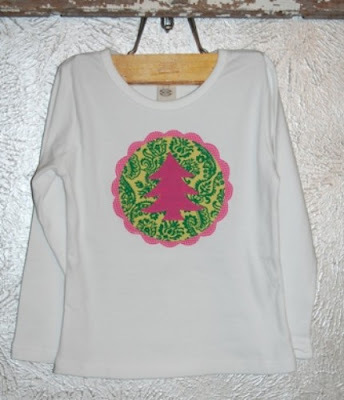 I am loving the scalloped edge Christmas tree shirt. I am weak when it comes to pink and green!! I love the boo Halloween shirt (and just about everything else)! I love, love, love the Bird Silhouette Tote Bag! I am crossing my fingers! I love the Halloween shirts and the tote bags...the butterfly and bird are super cute. Thanks for the giveaway and for the awesome blog! That skull and crossbones shirt is pretty much teh cutest thing I've seen in a long time! I love the monogrammed tote. There is so much nice stuff on the site that it is hard to decide. I also really liked the boys onesie with the lime green star. Very cute! i love the peace & flowers tank top so much, the haloween stuff. thanks for the contest! I love pumpkin - how cute!!! And I love the cameo too! So much to choose from - it hard to pick just one. And I am following Modern Frills on Twitter now. So super cute! I love the little necktie shirts for the little guys, but my absolute favorite is that pumpkin! Super cute stuff! I think the necktie shirts are so cute for little guys but my favorite is that pumpkin! Too stinkin' cute! OOOHHH I love the witch tote bag!! I need that for Halloween!!! Their shop is too cute!!! I love the boys business onesie! So cute! LOVE Tote Bag - Reusable, Earth Friendly and FABULOUS, cute! I like the orange polka dot boo shirt! So cute! I visited and i fell in love!!! Hard to decide but since it is fall, the pumpkin tee...in a ladies long sleeve brown!!!! It is really hard to choose. She has lots of adorable things. I do love the cakes on the cake stand. I like the cute Ruffle Tank! i'm following modern frills on twitter! the woman's ruffle tank is adorable. I LOVE the monogrammed totes! My favorite is the tote with the bird! It's so adorable!!! Since fall is my favorite time of year I would have to say the whimsy pumpkin app shirt is my favorite! 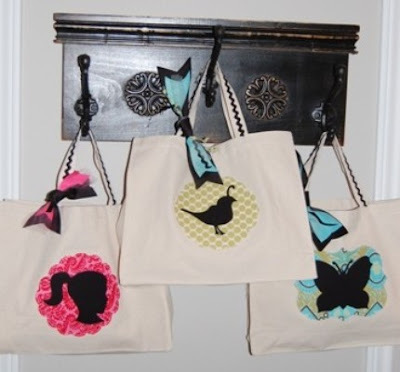 I love the cameo silhouette tote bags! I really like the Personalized Baroque Frame Shirt with Initial Monogram. Thanks for the chance to win! I love the three tier Madeleine birthday shirt! too cute! I love love love the pumpkin shirt---toooooo cute! Love the Boo Halloween Shirt with a black BAT. Fabulous stuff! 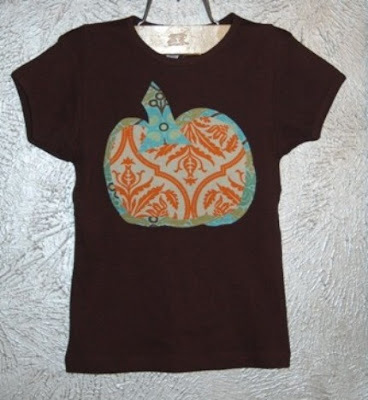 I love the pumpkin applique t-shirt. And the guitar t-shirt. And the Christmas one. Okay, I love it all. I'm also following Modern Frills on Twitter. I will definitely be adding them to my favorite Etsy shops. I love the Heart Bum Cropped Yoga Pants - Pink and Red DAMASK and POLKA Dots. I am loving al of the onsies but Im going to be selfish here and say my favorite me thing is the Love Tote. I could really put this to good use. Wow! It's so hard to choose. Everything is adorable. If I had to pick the Halloween and girl silhouette tote bags are my faves. See--I couldn't just pick one! the pumpkin shirt is PRECIOUS! pumpkins are my favorite fall decor! love it! All her stuff is amazing! I love the pumpkin applique shirt and the totes...but I think my absolute favorite is the Personalized Baroque Frame Shirt. SOOOOO CUTE!